My friend, Nattie, has been gone a year this Saturday. A whole year. 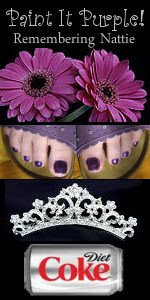 So, in honor of Nattie, I got a pedicure today and had them paint my toes purple. I think Nattie would think my piggies look cute.